Bloomberg News reported on Wednesday that, “Bilateral tariffs may reduce the value of U.S. farm exports to China by about 40 percent, according to a report published by the Chinese Academy of Agricultural Sciences, a government think tank. “U.S. soybean, cotton, beef and cereal shipments to China may each drop by 50 percent in value, it said in a report published on its official WeChat account on Tuesday, citing results of a simulation. The price of imported soybeans may rise 5.9 percent and imported cotton prices may increase 7.5 percent, with minor impacts predicted for other farm goods, it said. “The Daily Shot: From Corn to Milk, U.S. Agricultural Commodities Slammed Amid Trade Worries,” by Lev Borodovsky. The Wall Street Journal Online (June 26, 2018). And Alex Soderstrom reported on Monday at the Atlanta Journal-Constitution Online that, “An escalating trade dispute between the United States and top trading partners has one of Georgia’s largest industries caught in the crossfire, as tariffs recently implemented by China threaten to hit the wallets of farmers in the Peach State. Cotton, peanut, pecan and soybean crops in the state all face falling prices and the loss of major markets as a result of retaliatory tariffs either implemented or proposed by China. These import taxes have been created in response to new tariffs President Donald Trump has slapped on trading partners in recent months. 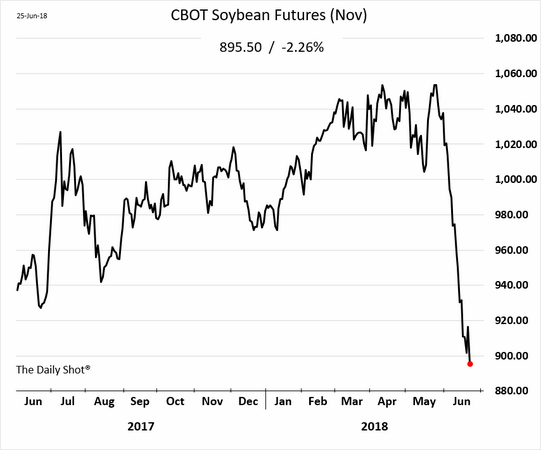 Also, Matthew Hansen reported late last week at the Omaha World-Herald Online that, “The soybean farmer hoped it might be a bluff. A hard-edged negotiating tactic. A whole lot of sound and fury from Washington, D.C., and Beijing that would ultimately signify nothing to his corn-and-soybean farm near Gresham. But now it is late June. Scott Richert’s beans stand a foot tall. Seemingly every day, the president he voted for escalates a trade fight with China. Seemingly every day, the price of his soybeans plunges further into the toilet. During the hearing, Sen. Michael Bennet (D., Colo.) indicated that he did not think the administration will have any backstop to help farmers and ranchers regarding any adverse impacts from trade (audio clip below). And after Sec. Ross noted that Sec. Perdue would use every power at his disposal to assist farmers with the negative market impacts of trade policy, Iowa GOP Senator Chuck Grassley pointed out that farmers would rather have money from the market place instead of the Treasury. In a column posted at USA Today Online on Tuesday, Secretary of Agriculture Sonny Perdue addressed agricultural trade issues and stated that, “In 2011, a group of Chinese nationals dug up genetically engineered seeds from an Iowa corn field and planned to steal and send them back to China, so they could be reverse engineered. Those seeds, the result of years of research and millions of dollars of American investment, now stand as one of countless pieces of evidence in the case against China for intellectual property theft and unfair trade practices. “Now, President Donald Trump is standing up to China, which wrongly believes it can bully our farmers to get America to back away from defending our national interests. The president understands that our farmers feed, fuel and clothe this nation and the world, and he will not allow U.S. agriculture to bear the brunt of China’s retaliatory tactics. Sec. Perdue indicated that, “There is no denying that the disruption in trade relations with China is unsettling to many in agriculture, but if the president succeeds in changing China’s behavior, America’s farmers will reap the benefits. “In the meantime, the president has instructed me to craft a strategy to support our farmers in the face of retaliatory tariffs. At the U.S. Department of Agriculture, we have tools at our disposal to support farmers faced with losses that might occur due to downturns in commodities markets. To this point, we have not unveiled our strategy, as it is not good practice to open our playbook while the opposing team is watching. Appeared on @SquawkCNBC this morning, laying out why @POTUS has held China accountable for its unfair trade practices and intellectual property theft. American farmers are patriots and will not have to bear the brunt of China's retaliation. 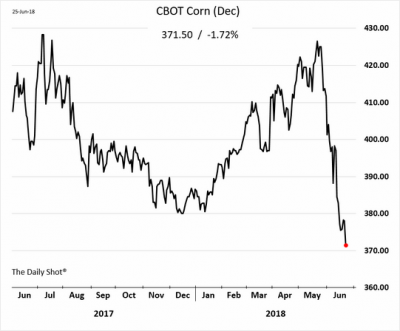 Reuters writer Mark Weinraub reported on Tuesday that, “Perdue said at a news conference the Commodity Credit Corp (CCC) could be one of the major tools used in any plan to compensate farmers hurt by the trade fight. The CCC has broad authority to make loans and direct payments to U.S. growers when prices for corn, soybeans, wheat and other agricultural goods are low.